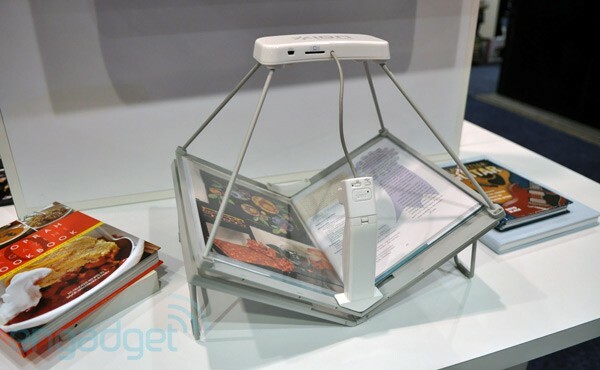 The Book Saver promises one-second color scans of both pages of a book and comes with OCR software and the ability to export to PDF or JPEG formats. Plans aren't quite finalized and the unit before us wasn't functional, but a 2GB SD card is expected to be included while there's also a USB connection to hook up straight to your PC or Mac. The big problem here is that there's no automation for page turning, and worse yet, you'll need to lift the entire, somewhat fragile, scanner in order to flip to the next page. That's done using that fetching Wiimote KIRF up at the front of the device and there are a pair of cameras embedded in the bottom of the overarching plastic casing. MSRP is set at $149 and availability is coming in June at places like Barnes & Noble, Staples, and Office Depot ... you know, in case you actually want one. Looks crappy and unusable though. hah, you beat me at posting this! While engadget's post about it rails it for being fragile, I don't think it's that bad of an implementation. My greater fear would be that they cheap'ed out on the components such that you still have to supply a lighting system and do a fair bit of processing after scanning. I would honestly pay 300-400 bucks for this if it had 10-12 megapixel image sensors (or a good system that achieves the same effect), and a good lighting system. The cameras are attached to the platen, which always seemed to me like the right way to do it. Their web site doesn't have any additional information than the Engadget article, but if the price point is what they say it is, I'm totally buying one. It's not suitable for archival and preservation use, not at that price point, of course. No lighting, and I'd bet money the images are ~3MP. But that's good enough for a lot of uses. Hey guys, we're already discussing this thing here -- mind if I merge the threads? UPDATE: I merged the other BookSaver thread with this one. Sixtysix posted about it first, and I merged that thread with my "new scanner tech watch" thread which I thought might be a nice place to talk about CES electronics, but turned out to be the wrong place to talk about the BookSaver. Sorry about that, SixtySix. vitorio wrote: The cameras are attached to the platen, which always seemed to me like the right way to do it. It seemed that way to me too, and I built my second scanner with the cameras attached to the platen. I'm back to having the cameras on tripods, not attached to the platen. In my case, they're not even attached to the base, though I think that would be workable. One problem which having the cameras attached to the platen introduces is that it's more difficult (and possibly impossible) to keep the camera and the book positioned the same way from shot to shot. The platen is placed on the book a little differently each time because it's being raised and lowered, and this affects how the shot frames the page. My design also incorporated a floating platen, which amplified the problem. The Ion Book Saver would have the same problem. A second problem, which didn't actually affect me while I was using this design, but which I realized with a book I scanned this week, is that the camera is typically restricted to landscape mode. Books which are wider than they are high will benefit from having a camera which can be rotated to shoot in portrait mode. Depending on how the camera is attached to the platen, this may not be an option. Design can probably overcome these problems, even with platen-attached cameras, but I think maybe the best design solution is not to attach the cameras to the platen. however if we could replace the sensors it would become more useful?? Looks like an Instructables design has been hijacked by a for profit outfit. These kinds of things bug me. I'm gonna guess someone did a lot of reading here and then found a way to package and sell a lot of hard work. Interestingly enough, the engadget article pans the device. this is not the optimal way to scan, since you need to pick by hand any time the upper glass component, imagine a 1000, 2000 pages book! anyway do you know how much it is costs? They are claiming it will cost $149. The BookLiberator people have put a hold on production because of it. I will do no such thing - I think that the BookSaver will not be very good quality, and that our software can still be improved, and that frankly, commercial offerings are irrelevant for the kinds of special projects we do here. Apologies for all the thread-merging and stuff - I don't want to break the flow of conversation around here.